I read this to be very interesting, thought it might be something for you. The article is called About Us and is located at http://www.aproperbakery.com/about-us/. Before Boulangerie, Kennebunk did not have a bakery. That is, Kennebunk did not have a proper bakery. There are plenty of lovely bakeshops and cake shops and bagel shops in town, but no proper bakeries. A place where bread is mixed and proofed for hours, and baked in the dark of morning, sending warm yeasty aromas wafting down the street as a harbinger of dawn. Boulangerie, a proper bakery, was conceived and created by Amy and Zachary Tyson. Over 10 years of planning, testing and tasting have been invested in the hearth stone oven. Amy Tyson grew up watching cooking shows on PBS, before celebrity chefs and cooking channels existed. As a child, she had the most fun baking bread because the process took so much time and the end result was always a surprise; like the one time she forgot to add the salt to her French loaf and 20 years later, in Italy, recognized the taste in Tuscan bread (which is made without salt). Zachary Tyson loves the formulas behind baking. As an engineer, he is very precise and very innovative. He enjoys manipulating the bread and recipes whereas Amy is a purist. Amy attended the Cordon Bleu in London. 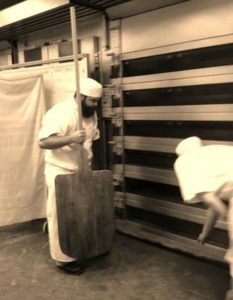 Zachary attended the International Culinary Center in NYC, specializing in artisanal breads. Together they developed their own starters (a stable culture of natural yeast maintained over time to act as a leaven in bread dough) for the various sourdough and levain baked daily at Boulangerie. They continue to collaborate and create new variations of classics – such as the Everything Croissant – Butter Croissant filled with Chive Cream Cheese and sprinkled with Everything Topping. In addition to bread, Boulangerie offers traditional pastries such as a variety of croissants, scones and muffins. The lunchtime menu includes chicken salad and panzanella salad, soup, focaccia, meat pies, and a small selection of baguette sandwiches including local Blythedale brie with foraged ramps (when available) and Casco Bay sea salted butter. Also: Caprese on Ciabatta and ham & cheese on baguette. Supporting Maine farmers and businesses is a priority at Boulangerie. Whenever possible, ingredients are sourced locally. From the eggs in the dough to the cream in the roasted coffee, Maine Made is featured in and on products as often as possible. Honey, cheese, tomatoes, beer… the list goes on and on. In addition to supporting local business, Boulangerie supports local charitable organizations on a daily basis including the local animal shelter and the Food Pantry by donating all profits from our recyclables to the shelter and donating unsold bread to those in need. 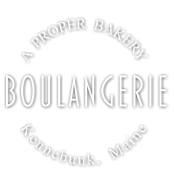 Boulangerie, A Proper Bakery, is located in Downtown Kennebunk, just behind the Pavilion. The interior of the big, red barn, which dates to the early 1900s, was finished using reclaimed wood, stained glass, cornices and antique fixtures. The space is unique, warm and inviting. A lot like Kennebunk itself.